Contemporary practices that fall outside the gallery mainstream have been in the spotlight recently. After an undeserved period in the critical wilderness, collaborative, publicly-engaged and site-specific practice have begun to hold their own as structures worthy of regular examination. Certainly a milestone in this re-awakening—though not without its flaws—was Nicolas Bourriaud’s seminal book Relational Aesthetics (RA) . The success of Taking The Matter Into Common Hands however, as the latest of these way-markers, is that enough time seems to have passed for RA to be treated as a landscape we have already traversed rather than a monument to stand before in awe. ‘Moving on’ from RA is a position that Billing, Lind, and Nilsson take seriously, and largely achieve within the pages of Taking The Matter… A collection of interviews, essays, short fiction and criticism, it offers a polyphony of dialogue. What links these, at times, disparate texts, is both discussion of the many forms of ‘collaborative practice’, and a symposium of the same title held in Iaspsis, Stockholm, in 2005. The book’s position as a symposium publication is crucial in fostering an interpretive approach. The writing here—by contributors Tirdad Zolghadr of SHAHRZAD, Marion von Osten, 16 Beaver and Marysia Lewandowska among others—is often personal and subjective. Though the texts may be open to criticism because of this unguarded feel, the tone does inject a welcome freshness to the field. But there are gaps. There is a link made between the act of collaboration and an assumed left wing political ideology that remains largely uncritiqued. 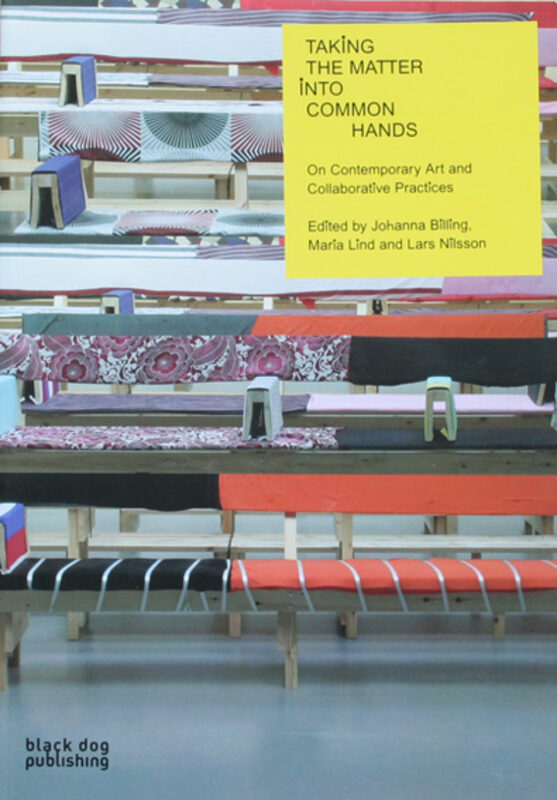 And the toe-curlingly laborious aesthetic used throughout is hard to enjoy, though designed by the international design group Åbäke, participants of the symposium. Despite this, Taking The Matter… is a revealing, informative, provoking and energetic publication. As an exercise in collaborative editing, it seems to follow its own advice—a definition of collaboration that, as an occasional collaborator myself, I both recognise and appreciate. True collaboration, the editors conclude, “simply has to make possible that which is otherwise impossible’. And so it does.